D.G. 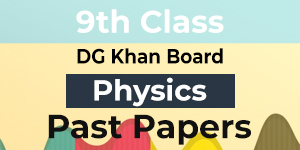 Khan Board is one of the important boards of Punjab. It caters the conduction, evaluation and declaration of results of Matric and Intermediate students from D.G. Khan and its surrounding areas. Board of intermediate and Secondary Education DG.Khan was constituted under the West Pakistan Board of Intermediate and Secondary Education (DG.KHAN) Ordinance, 1989 (now repealed) out of Multan Board. The main purpose of BISE D.G. Khan is to hold and conduct examinations pertaining to Intermediate Education, Secondary Education, Pakistani and Classical Languages and such other examinations as determined by the government. To grant certificates and diplomas to the successful candidates. 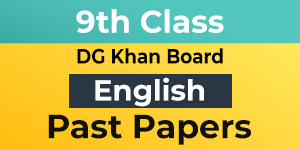 On this platform, we are providing 9th class past papers to the students to help them understand paper pattern and practise the important questions according to the paper point of view.